Savannah, Georgia, is as of romantic and charming of a city as they say it is. With Spanish moss, horse drawn-buggies, ornate architecture and an aura of elegance, it truly is a historic destination rightfully known for its Southern hospitality. That said, many places in this city are not-so-shockingly regarded as haunted, given Savannah’s contentious history during Antebellum Period and Civil War. So in addition to activities like educational walking and trolley tours of Savannah, cruising on the river aboard the Georgia Queen, exploring the city’s 22 original lush park squares (Chippewa Square is the one where Forrest Gump pondered life on a bench,) and perusing countless boutique shopping areas, you can also sign up to get spooked on a number of haunted ghost tours and cemetery walks. When it comes to indulging, we all know the South doesn’t skimp on the goods — obviously talking about butter! Moreover, Savannah is one of the few places where open containers of alcohol are 100 percent fair game. All in all, this Southern gem has all the workings for the perfect date — whether day or night — or even a dreamy weekend getaway. 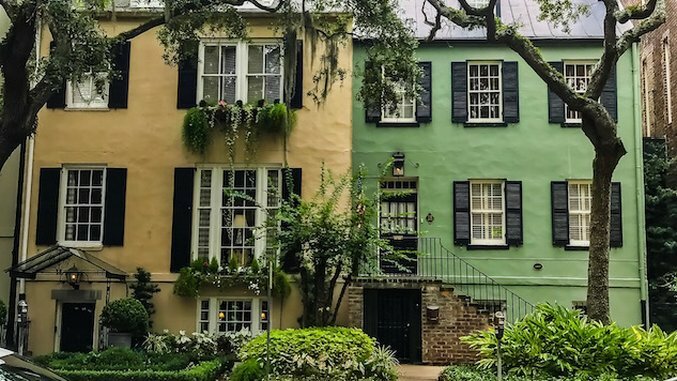 Combine delicious food and booze with warm nights and a city literally built for beauty (Savannah is America’s first planned city,) and you’re practically guaranteed a magical time. Built in 1771, the Olde Pink House is named after the pink stucco that covers its old brick exterior. Originally the James Habersham mansion, it boasts beautiful colonial architecture and today serves as one of Savannah’s most popular restaurants. Its grand dining rooms are decorated with candelabras, chandeliers, and fireplaces, while the walls are lined with historic portraits and ancient antiques. The menu is enormous, featuring southern classics like the Chef’s fried chicken, shrimp and cheddar cheese grits, and the most satisfying “BLT” salad with fried green tomatoes, and thick sweet bacon, drizzled with a buttermilk dressing. Another signature dish worth getting is the impressively platted, sweet n’ salty crispy scored flounder with an apricot sauce. Also on the menu are favorites like bourbon molasses-glazed grilled pork tenderloin and a bone-in cowboy ribeye. Start off with a round of festive pink lady cocktails and be sure to ask you waiter about the history of this Savannah establishment. Fun fact: Habersham Jr. supposedly hung himself in the basement in 1799 and wanders the property freaking patrons out on quite nights. Keep an eye out! Looking to continue the night with a post-dinner cocktail? Head over to the upscale cocktail lounge, Artillery. Built in 1896, Artillery is located where the Georgia Hussars’ armory once housed the cavalry’s artillery. With the building’s original architecture and façade, along with modern design elements, the ambiance is classy, eclectic and lavish. For an unforgettable meal, head to The Grey, an upscale dining spot set within a completely renovated Greyhound bus depot from the 1930s. With an art deco design, a refurbished ticket booth that now showcases an open kitchen, plush booth seating, a raw bar and a fully stocked bar complete with highly skilled mixologists who put on a show as they shake cocktails to perfection, The Grey offers an unpretentious, top-notch dining experience. They even serve you amuse bouches throughout your meal. Head chef Mashama Bailey offers Southern classics with an Italian twist. Expect rich dishes like crispy coppa with ricotta, braised lamb shoulder and whole-fire roasted trout. Don’t miss out on their creative cocktails ether. Try the tropical Far Tortuga or the inventive celery sour. Night going well? Book at stay at the Foley House Inn, a delightful bed and breakfast that offers cooked to order breakfast, afternoon tea with freshly baked goodies, and a wine and cheese happy hour daily. The famous Leopold’s Ice Cream is a lively, retro sweet shop that’s been around since 1919. For nearly 100 years this old fashioned parlor has been churning up homemade ice cream in flavors that range from the classic butter pecan and lemon custard, to honey almond and cream and chocolate raspberry swirl. They also have monthly featured flavors. Though often packed, with a line wrapped around the block, Leopold’s ice cream — and its ambiance — is worth the wait. There’s an old-fashioned soda fountain, sundae holders, banana split boats and malted milk dispenser, all in their original condition. Plus, the interior is adorned with Hollywood memorabilia from Stratton Leopold’s 45-year career in the movie industry. The Savannah City Market is a spacious four-block outdoor market space that’s been around since the 1700s. Filled with eateries, cafes, and plenty of art galleries and boutiques, it’s an energetic part of the historic district and great if you’re looking for Savannah-made souvenirs. Not to mention live music and entertainment flows through the market daily. Be sure to stop by the famed Byrd’s cookies for some of its signature Georgia Peach Cookies and by Wet Willies for one of their frozen daiquiris to-go, which come in more than 20 flavors. Or if you’re looking for a nice lunch spot, take a seat at Belford’s. Also an historical site built originally in 1902, the menu offers lunch items like their signature jumbo lump crab cake, fish and chips and seafood linguini. Finally, if you and your date are beach people, take a short 30-minute ride over to Tybee Island. The best way to explore the island is on a bike, so grab a couple rentals at Tim’s before exploring this quaint beach town. Just down the road from Tim’s are the Shops at Tybee Oaks where you can check out quirky shops that sell antiques, knick-knacks, clothing and jewelry. Continue on to the Tybee Lighthouse where you can climb to the top to see a view of the whole island and take time to explore the nearby by Fort Screven area (if you’re not burnt out on history yet). Lay out on the white sands by the Tybee Island Pier or for the more adventurous couples, get active with kayaking, jet skiing and paddle boarding. And for animal lovers, a sunset dolphin cruise is never a shabby idea. Wrap up your day at A-J’s Dockside Restaurant which not only overlooks the river but also has a menu full of fresh seafood that includes king crab legs and incredibly addictive fried items like shrimp, oysters and scallops.